I love Charlie Trotter’s cookbooks. The recipes can be very complicated, but can be made ahead in stages. Many call for flavored oils I can make (or buy, dependent on my mood), or salsa’s that can be made ahead and used in final assembly. The flavors are always so complementary… one bite of all the flavors together tends to get real wow factor. Probably my favorite of his many books (partly because it’s the most approachable), is his Kitchen Sessions book. When I’m looking for something fancy, this is my go to book. We were looking for something fresh, light, and delicious, and this recipe seemed to fit the bill. 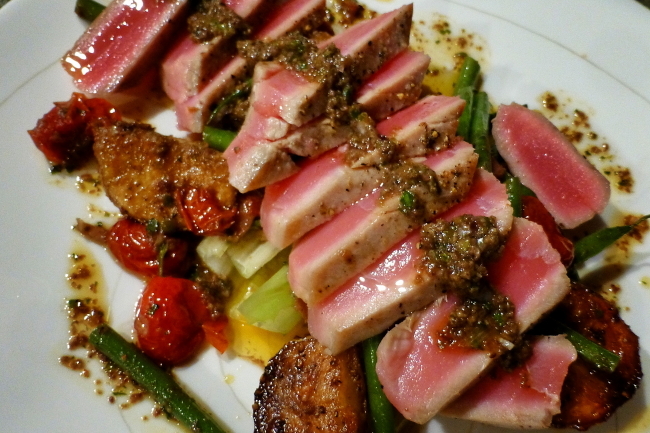 It’s a different take on a standard tuna nicoise salad with the flavors jacked up. I made a tapenade for the olive component, in my mini food processor I combined: green and kalamata olives, capers, parsley, green onion, salt, pepper, lemon juice and olive oil and minced until a nice thick consistency. I slow roasted some grape tomatoes in a oven proof dish with some olive oil, salt, pepper, and thyme at 275F for 2 hours until soft and intensely tomatoey. I roasted red potatoes in the oven at 400F for 1 hour (or until easily pierced with a fork). I was able to do these earlier in the day, so that dinner prep was easy. At dinner, I seasoned a half of romaine and pan seared (or grilled) it until lightly seared. (Trotter calls for spinach sautéed.) That made the base for my plate. Then I seasoned and quickly seared my tuna. I let it rest momentarily while I threw into the same pan to sauté: cut up roasted potatoes, roasted tomatoes, green beans, a good dollop of tapenade, and a splash of balsamic vinegar, just to warm through. I poured the potato, tomato sauté mixture over my romaine (or spinach), sliced the tuna and layered it over top. It was delicious. Very complex flavors. I could have even used a nice steak, chicken or other meat… the flavors were very rich and deep. Yum! This entry was posted in What's For Dinner and tagged charlie trotter, nicoise, tapenade, trotter, tuna on January 28, 2015 by kritterspaw.